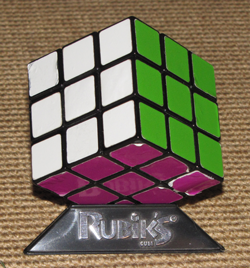 I remember when Rubik’s Cubes first came out in the eighties. All my friends had one so I just had to have one too. Somehow I got one. Probably as a sixteenth birthday present instead of a car. I was ecstatic. It is probably an urban legend, but some people say that Mr. Rubik did not even think his three-dimensional puzzle could be solved. The legend probably started because the box had no instructions on how to solve the puzzle. And there was no internet to let people share with each other how to solve it. So I spent hours and hours and hours figuring out the doggone thing. I was going to solve it whether or not Mr. Rubik could. Of course, it turned out that the Rubik’s Cube could be solved. There was even a book (The Simple Solution to Rubik’s Cube) that showed you how to do it, which most of my friends bought. I did not. I could not bring myself to admit that I had to use somebody else’s solution to solve my problem. Like everybody else, I started out with the solved puzzle. But I had already used other people’s cubes, so I knew how easily they went from solved to unsolved. So instead of rushing in and messing things up, I decided that I would figure out how the pieces moved. I made patterns and then unmade them. I turned one row this way and that, then I turned a column to see where pieces ended up. Eventually, the cube was too messed up for me to solve. But instead of rushing out to get the book, I just took the Rubik’s Cube apart, put it back together solved, and started over. This process took me quite a while, but eventually, I solved the cube. I could put Humpty Dumpty back together again. Mostly. There was still a part at the bottom of the cube where I just fooled around until I got things in the right place, but I could finish the puzzle. Sometimes even quicker than my buddies. 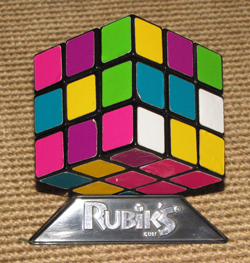 I know it is not lightning fast like today’s times, but I once beat my friend, Rob, in solving the Rubik’s Cube with a time of 2 minutes and 30 seconds. I was taken back to those days of yore when I saw one of those old books on how to solve a Rubik’s Cube. One of my students had one that one of his parents bought back in the eighties. The thin book had been used, but not abused and my student was using it to show one of his buddies how to solve the cube. One of my own sons, Thing 2, is also trying to solve the cube. He has looked on the internet, but apparently, that is not as good as real pages. Unfortunately for him, neither of his parents ever got the book. In fact, one of his parents is imposing his own will on him and not instructing him on the way to solve the puzzle. However, I did tell him the method I used to solve it. While this may or may not have helped him get over the fact that I was not going to show him how to do it, it must have helped alleviate some of the frustration when I told him it took me months to figure it out. Thing 2 will probably figure it out eventually too. Either that, or he will break down and get his own copy of the book. It is too bad that we already have a Rubik’s Cube. After all, a cube or maybe the solution book would be a great sixteenth birthday present for Thing 2. Not as cool as a car, but maybe he would be as ecstatic as I was when I got my Rubik’s Cube.